iWatch News and Newsweek analyzed high-school graduation rates posted by the nationally recognized Editorial Projects in Education Research Center and math and English standardized test scores for kindergarten through 12th grade that are maintained by MPR Associates Inc., a well-respected education statistics agency. 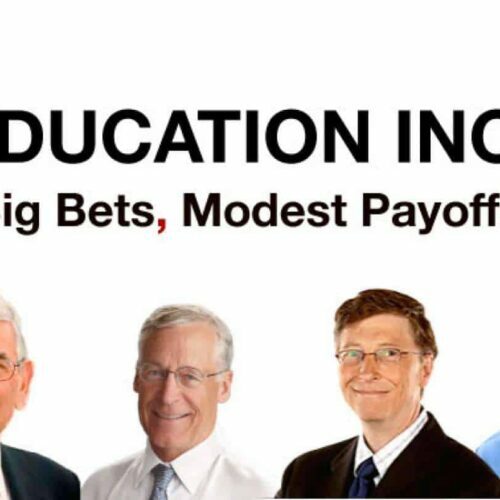 Among other things, MPR helps philanthropist Eli Broad’s foundation select urban school districts for its annual “most-improved” charitable awards. Both agencies are respected throughout the education industry, in part because they use consistent methodology are normalize data to allow comparisons between individual school districts and their states. Using test scores to measure school effectiveness remains controversial inside and outside education circles. But they are used by foundations and government alike, and the philanthropists made such measurement a key part of their platform. MPR’s data only compare years when testing methods were constant. Because state tests vary in rigor, proficiency scores are not comparable across states. The analysis focused on 10 urban districts that have gotten much of the philanthropists’ attention and $1 billion of their money: New York, Chicago, Los Angeles, Washington D.C., Austin, Tex., Houston, Dallas, Milwaukee, Denver and Oakland. The goal was to compare their performances against all other districts in their states in years since reform efforts began. For Washington D.C., where the District is not part of a state, test results were compared against scores from independent charter schools in the District. However, Editorial Projects in Education Research Center does not have comparable graduation rates to compare the charter schools to the District’s graduation rates. Test scores covered 2006-2010. Over that period, iWatch News calculated how many times one of the targeted school districts raised its test scores over the previous year’s scores more points than the average of school districts in the rest of the state. In years when test scores fell, iWatch News also tracked whether the targeted schools fell fewer points than their peers statewide. Similar calculations were used for measuring changes in graduation rates but were based on 2002-2007 data, the most recent years available. The Center then calculated a simple percentage to see overall how many times the urban districts improved performance faster than the other schools in their respective states. Those percentages were also calculated for comparisons among elementary, middle and high schools in math and reading scores separately. Bill Gates, prep school grad and college dropout, had come before the National Governors Association seeking converts to his plan to do something about it — a plan that would be backed by $2 billion of his own cash. Their bets have been as big as their egos and their bank accounts. Microsoft chairman Gates, computer magnate Michael Dell, investor Eli Broad, and the Walton family of Wal-Mart fame have collectively poured some $4.4 billion into school reform in the last decade through their private foundations. Has this big money made the big impact that they — as well as teachers, administrators, parents and students — hoped for? In a first-of-its-kind computer analysis, iWatch News analyzed the graduation rates and test scores in 10 major urban districts — from New York City to Oakland — which collectively took in almost one-fourth of the total money poured in by these top four education philanthropists. The results, though mixed, provide dispiriting proof that the billionaires have not found a one-size-fits-all solution to education reform and that money alone can’t repair the desperate state of urban education. For all the millions spent on reforms, nine of the 10 school districts studied substantially trailed their state’s proficiency and graduation rates — often by 10 points or more, the analysis found. And while the urban districts made some gains, they managed only 60 percent of the time to improve at a rate faster than their states. Those spikes weren’t enough to materially reduce persistent gulfs between poor, inner-city schools, where the big givers focused, and their suburban and rural counterparts. The bottom line? The billionaires aspired to A-plus impact, and came away with B-minus to C-minus results, according to iWatch News’ investigation, which was based on specially commissioned data, internal numbers shared by the philanthropists’ foundations, as well as the billionaires’ own statements. The analysis examined what happened in the target districts to high-school graduation rates between 2002 and 2007, the most recent year for which data was available from the nationally recognized Editorial Projects in Education Research Center. No yardstick is a perfect measure. And the billionaires’ gifts are a drop in the bucket when compared with the $600 billion spent annually on America’s schools. But the city-to-state comparison is one that Broad’s own foundation uses to help determine his annual award for the most-improved school district. Despite the money, graduation rates in Oakland actually fell by 6 percentage points, beating the rest of California’s schools which fell by 9 points. In Houston, graduation rates dropped about 6 percentage points while the remainder of Texas fell only 2. Graduation rates in New York City on the other hand, while still trailing state averages significantly, improved markedly — up 18 points, compared to the state’s 10 point rise. Washington, D.C.’s elementary and high school math scores improved somewhat (not being part of a state, its reading and math performance was measured against the district’s independent charter schools). But DC’s education achievements, which have helped fuel a national debate over education reform captured in the hit documentary “Waiting for Superman,” have lately come under investigation, amid suspicions of cheating, a charge former D.C. schools Chancellor Michelle Rhee denies. Oakland also fared poorly in high school — with reading scores that trailed California by 18 percentage points in 2010. Los Angeles underperformed the rest of California by 6 percentage points in elementary school math. Both cities, however, more often than not improved overall at a faster rate than the state. The confidence that marked Gates’ landmark speech to the governors’ association in 2005 has given way to humility. The billionaires have not retreated. But they have retooled and learned a valuable lesson about their limitations. Gates has abandoned his $2 billion high-school campaign focused largely on shrinking the overall size of schools, in favor of a new effort to encourage effective teaching, saying he’d learned small schools alone can’t boost student academic performance. And Broad put an initiative aimed at improving the training given school principals on pause and focused instead on charter schools, training for school district administrators and improving teacher performance. Meanwhile, on the ground in some of the districts these billionaires selected, the excitement of being chosen for philanthropic funding — the feeling of having won the education lottery — has all too often given way to a sober sense of diminished expectations and feeling of being abandoned too soon. “The foundations are looking for rapid-fire turnaround. That’s not realistic,” said Hae-Sin Thomas, a former principal who helped manage the Gates-backed small schools effort in Oakland, Calif., before the Microsoft guru dropped that campaign. In Oakland, where many neighborhoods are wracked by poverty, the school system’s dysfunction and financial woes led to a state takeover eight years ago. And that made it a magnet for the billionaires. The Michael & Susan Dell Foundation chipped in $6.2 million for its first experiment with broad data collection methods used to monitor student and school progress. The Bill & Melinda Gates Foundation ponied up some $30 million to help expand on a grassroots effort to shrink the schools. And Broad’s foundation invested $7 million for charter and district schools. “It was a chance to rethink how the district was designed, moving from a concept of a highly bureaucratized school system to a portfolio of schools,” said Kevin Hall, chief operating officer for Broad’s foundation at the time. Hopes soared — only to crash back down to earth. The district went through five superintendents in seven years. Enrollment at many schools shrunk, and the district still is plagued by a 40-percent high school dropout rate. In lower grades, better performing students are fleeing: a third of the kids who are deemed academically proficient by sixth grade are defecting to private, suburban or charter schools. And at least seven of the 49 new, smaller schools funded by Gates have closed; others are hanging on by a thread. The quality of high schools remains uneven, he said. Students who lag below their grade level, in families that are “most distressed,” often are geographically distant from, or even unaware of, the better schools, and end up settling for low-performing local schools. Smith sees another factor for failure inside a horrific scattering of red dots on a city map he displays on a PowerPoint in his office. Each dot is a student lost to gun violence — a dozen African-American and Latino boys gone since last summer, all slain on the hardscrabble streets of the city across the bay from San Francisco’s famed skyline. Reminders of the billionaires’ drive-by visits are everywhere, along with the gnawing problems the reforms didn’t address. “Math is Liberation” a classroom poster shouts. Nearby is a hand-drawn sign: “RIP Chris Jones. When we think of you, we see the human face of love. 1993-2010.” The 17-year old college-bound musician wanted only to get in the car and go for fast food with his mom when a gunshot ended his life. These days Smith is trying out his own vision of a “full service community district” — one that tries to address challenges outside the classroom like nutrition and racism, and especially the persistent struggles of African-American boys. But the philanthropists did leave a legacy for Smith to build on, at least in the lower grades where some schools have seen strong academic growth. The district increased from 11 to 50 the number of schools attaining a score of 700 toward the California achievement target of 800. And between 2008 and 2010, Oakland has outpaced the rest of California in improvement at the elementary- and middle-school levels. The reform era also left its own financial mess. Many of Oakland’s bold reforms simply weren’t sustainable once the billionaires’ money dried up. The officials imported to run the district during the salad days left Smith a $25 million deficit — including more than $5.4 million in state fines for audit failings. Parents wonder whether the whole experience was worth it. Ell Parker has the personal pride of a mother who saw her 10-year-old son earn a perfect score on his California math test and the anguish of an educational instructor who still sees violence, poverty and other ills ruining education for vast numbers of students. “Where’s my bumper sticker?” she wondered as she compared her city’s troubles with the car tags of suburban parents touting their children’s school honors. The business titans entered the education arena convinced that America’s schools would benefit greatly from the tools of the boardroom. They sought to boost incentives for improving performance, deploy new technologies, and support outside-the-box leaders with a willingness to shatter old orthodoxies. They pressed to close schools that were failing and sought to launch new, smaller ones. They sent principals to boot camp. Battling the long-term worry that the best and brightest passed up the classroom for more lucrative professions, they opened their checkbooks to boost teacher pay. It was an impressive amount of industry. And in some places, it’s worked — but with unanticipated complications. One of those places was New York City. Boasting 1.1 million students spread across nearly 1,700 schools, New York City drew the lion’s share of philanthropy — $500 million in all — and saw results. Graduation rates improved from 37 percent in 2002 to 55 percent by 2007 (New York state’s overall graduation rate by the end of that stretch: 71 percent). The big-money donors benefited from a well-placed ally. New York Schools Chancellor Joel Klein, a former Clinton White House lawyer, launched his own package of reforms that dovetailed with the billionaires’ goals — reorganizing the power structure and replacing failed schools with smaller, mission-driven ones. He also installed “CEO”-style principals, and bucked criticism that his laser focus on core math and reading curricula was narrowing the scope of learning. The numbers began to move in the right direction. But the tactics bred resentment among some educators and parents. Klein stepped down last year with low approval ratings. The CEO approach took a further hit when his successor — publishing executive Cathie Black, who had no background in education — flamed out after just 100 days on the job. What’s worse, last year New York state declared only a quarter of the city’s graduates college-ready, sending officials back to the drawing board. And although acknowledging gains in New York, Gates scrapped the small-schools project, decreeing that overall it had failed to produce students who were ready for the rigors of college. Philanthropies have shown keen interest in backing experiments that untether teacher pay from years on the job. Denver relied on foundation money, before the passage of a local tax, when it launched its program to pay extra money to teachers who would to work in hard-to-staff inner city schools and could show improved student test scores. The effort attracted strong new teachers, but has not prompted better or worse teaching from teachers already on staff. “No demonstrable motivational effect,” said Tom Boasberg, the superintendent. Research elsewhere supports that conclusion for assorted merit-pay schemes. “If anything, teacher incentives may decrease student achievement, especially in larger schools,” Harvard researcher Roland G. Fryer concluded recently after analyzing New York’s flirtation with a model that tied incentive pay to overall school performance rather than individual teachers. Still, some combination of pay and teacher support may yet make a difference, especially with new teachers. Gates is delving deeply into the topic, devoting $290 million to experiments in Pittsburgh, Memphis, Hillsborough County, Fla., and Los Angeles charter schools, and millions more for research on what makes a good teacher. In Washington, D.C., teacher Kerry Sylvia said her ability to help students is not dependent on a bonus, but on support for things like field trips or healthy snacks to lure them for after-school help. Her school, Cardozo High, churns with students moving in and out due to poverty or failure to measure up at magnet or charter schools. “I don’t teach for the money. I’m not buying into this,” Sylvia said. She recently plunked down $45 from her own wallet to board 18 of her seniors on a subway so they could participate in a mock trial. All dressed up, the students were excited at the novelty of researching and role-playing defense and plaintiff teams in a real courthouse, a side of them Sylvia doesn’t often see. In addition to paying for the subway, Sylvia later drove one student home so she wouldn’t walk the dark streets alone. “That doesn’t get measured on the test,” Sylvia dryly noted, referring to teacher evaluations based partly on student scores that help determine which teachers get bonuses. No reform has won more philanthropic favor than public charter schools. Now numbering 5,000 across the country, charters receive tax dollars to operate with considerable autonomy and innovation. The quality of charter schools varies widely, and some have posted dramatic gains, with strategies like longer school days and strong teacher support for students. Drawn by the results of charter networks like KIPP, the Knowledge is Power Program seen in the “Waiting for Superman” documentary, the billionaires’ foundations have poured more than $900 million into charters, including $466 million from the Gates foundation alone. I I ncreasingly, they are putting their money behind charters with the best records, acknowledging that charters overall have had mixed success. Charters are more likely than other schools to be among both the top ranks of California schools and the bottom performers, the state’s Charter Schools Association recently found. Stanford University research found that on average just 17 percent of charter students in a 16-state sample tested better than in traditional public schools. A U.S Education Department-commissioned study last year was similarly mixed. “Putting the sign ‘charter’ over the school doesn’t say much about it. It tells you it’s got the opportunity to be different, innovative and better. But it doesn’t guarantee any of that will happen,” said Chester Finn, Jr., president of the Washington-based think tank, Thomas B. Fordham Institute. The Walton Family Foundation hoped that its $8-million investment in Milwaukee charters would produce strong schools and a competitive environment to raise the bar across all the city’s schools. But the charters failed to outperform traditional schools. Reading scores were mostly flat over the last five years citywide. In math, elementary and middle school gains were stronger than in the rest of Wisconsin, but high school proficiency dropped two points to 31 percent. Blew said the Waltons maintain their theory that charter competition can raise scores across school districts, and still hope that all Milwaukee schools will improve. The charter movement has yet to fulfill another key goal of reformers―that successful charter methods would migrate to regular schools. “There’s been more tension than not between charter schools and regular schools,” acknowledged Vicki Phillips, the Gates education director. Michael Dell’s family foundation, too, placed a big bet on charters, along with its signature work on data and technology systems for schools. Dell, a University of Texas dropout who was in such a hurry to enter the business world he asked to take a high-school equivalency exam at the tender age of eight, began in his native Texas, where his foundation helped to insert a high-performing charter school onto a traditional high-school campus in Houston. Lee High School officials were excited at the prospect of copying the strongest elements of the charter. But it turned out the district wasn’t ready to let Lee try charter practices like a longer school day and taking more control over hiring, said Steve Amstutz, who was Lee’s principal at the time. “The premise that we were going to learn from each other really never occurred,” he explained. “It evolved to just being a lease agreement.” The charter eventually moved to another location. In Dallas, Debby Edgar wanted to make sure her granddaughter, Gwen, a straight-A student, was on track for admission to the prestigious Townview High School for the talented and gifted. Edgar monitored Gwen’s school work through the district’s computerized “dashboard.” She could log on through a portal to see Gwen’s grades, absences, and progress toward graduation. She set up an email alert to ping her if Gwen got so much as a B. “Even teachers make mistakes, which can affect your GPA,” said Edgar. The dashboard eased her mind until the coveted letter from Townview arrived. Gwen was admitted. Thanks to the Dell family foundation, similar tracking systems are popping up across the country, part of philanthropy-backed efforts to centralize huge amounts of data to profile students and help evaluate teachers, school progress and trends. The Dell family foundation has invested $135 million in what it calls performance management for some two dozen school districts and charter organizations. “The timeliness of the information has had an incredible effect on how parents and teachers can react to problems or issues, said Arnold Viramontes, the chief of staff for Dallas schools. On the other hand, when offered largesse from the foundations, “it’s not all peaches and cream,” said Dallas Superintendent Michael Hinojosa, whose district has received $22 million from the Gates and Dell family foundations in recent years. He drew the line when one foundation pushed a plan he thought gave principals too much autonomy. The setbacks can be a humbling experience for titans accustomed to outsize success. Broad entered the education reform arena with a fortune built at two Fortune 500 companies. Thinking his billions might make a difference, as he did in the Los Angeles arts and cultural community, Broad embarked on a yearlong investigation of education. “It was clear to me that if we wanted to have an impact, we could look at what others had done and then what we could do,” he told iWatch News. “There weren’t many positive results that we could identify with. There was always pushback from powerful interests,” in the face of reform. School boards seemed an especially ripe target. Broad began training efforts to get them away from what he saw as mind-numbing and counterproductive minutiae, like choosing paint colors for buildings or fixing stadium lights. The effort proved frustrating. Board members themselves, as he saw it, were often problematic; too many were well-meaning but not especially savvy parents, micromanagers or excessively political. Broad moved on to the front lines: superintendents, principals and school district management, ultimately spending $116 million on training people to work in schools and district offices, and another $71 million on central office reforms and teacher evaluation, preparation and pay schemes. Viewing competition as a key to challenging the “government monopoly” that often impedes school reform, he also invested in high-achieving public charter schools. His approach is to treat education reform like venture capital investments. “Our role is to take risks that government is not willing to do. We get a lot of pushback. People question my motivation,” he said. Not least is a growing unease with the prominent role of private foundation money that doesn’t have the accountability constraints of public tax dollars. “The fact that I don’t concern myself about criticism or pushback helps,” Broad said. He’s had to take some lumps. Several principal training programs, to the tune of $45 million, were a bang-for-the-buck disappointment; student test scores under most of the principal graduates did not improve commensurate with his expectations. He pulled the plug, and reevaluated before trying a “more rigorous” approach for the next round of training programs. Graduates of his Broad Superintendents Academy and the dozens of MBAs he has placed in school district management, on the other hand, have largely measured up. Even so, superintendents sometimes shake things up only to see their efforts falter in the face of political and bureaucratic pressures, Broad said. It’s all part of what Broad sees as his mission to fight status quo inertia. Despite their decidedly mixed track record, the billionaires are not leaving the fight. They’ve just changed strategies and adjusted their lines of attack — behaving, in short, like businessmen. Only these days, they’re beefing up their chances in the classroom by also turning toward the halls of Congress and state governments, impacting elections and hoping to shape public policy. The Waltons, for instance, committed $42 million in 2009 to improve policies for charter schools and voucher programs. And Broad and Gates spent $25 million valiantly trying to raise the profile of education as an issue in a 2008 presidential campaign that was, unfortunately for them, dominated by the recession, two wars and Joe the Plumber. In addition to his new laser focus on teaching, Gates also is making new investments, including for technology innovations like game-based classroom tools and social network learning, all aligned to uniform academic standards that are being adopted across the country. Lois Leveen, communication director for Grantmakers for Education, a nonprofit association representing 260 foundations, agrees. iWatch News Managing Editor David Donald and Reporter Laura M. Colarusso of Newsweek contributed to this story.